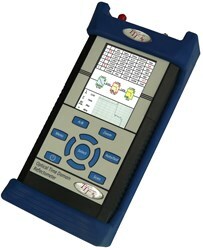 The FTE-7000A is an optical time domain reflectometer (OTDR) that features instant-on and immediate scan functionality. This model also includes an integrated Video Scope with a pass/fail grading map, an AutoTest/AutoWave power meter, and a CW/Fiber identifier light source. This OTDR has a 36dB dynamic range and a 1 meter dead zone. It’s ideal for testing and troubleshooting in LAN, MAN, and WAN applications. The FTE7000A’s bright 4” color touchscreen is easy to use, and its Fib-R-Map schematic event analysis, pass/fail threshold setting, and onboard context sensitivity help new users get to learn the unit quickly. The FTE7000A OTDR comes in a hardened, water-resistant enclosure and its rubber boot with bail adds additional protection. For additional information, download the datasheet.